I loved this book. It's set in 1964, South Carolina. The story is about a 14 year old girl and her struggle to come to terms with her mother's death. I don't like to give a lot away but she lives with her emotionally abusive father and ends up living with 3 sisters on a bee farm. There are issues about Civil Rights and race relations as well. It also gives you a new perspective on bees. I'll never look at them the same again. From the first chapter, I was in love. I read in in the past few days every chance I got. Finishing faster once I knew the movie was on this weekend. The imagery was beautiful and I found myself drawn to the characters immediately. I especially loved the Boatwright sisters. Their bond was so genuinely beautiful. The author has an ability to describe a scene in such a way that made me want to be there. Right in that bee farm, right in that pink house. There was a wonderful theme of female friendship and love. I highly recommend this book to anyone. It's a wonderful story, beautifully told. I won't be returning this gem to the book-man. I watched the movie this morning and it was very good. Of course no movies live up to the book but I found this adaptation to be fairly true to the book, with a few changes. They have to rush through some parts in order to make a movie under 2 hours. The best part was Sophie Okonedo as May Boatright. She was just as I pictured her. I loved her character so much. Dakota Fanning is a very talented young actress and was perfect for the part of Lily. Thumbs up! I just got done reading this! I liked it alot too. Now I'm reading "Cold Mountain" which is breathtaking. 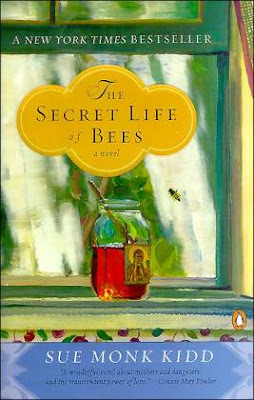 0o0o0o Ill have to pick this one up, there is a movie called the secret life of bee's is it the same story? Stephanie, Wasn't it great? I'll look for Cold Mountain. I also really liked this book. When is the movie on? I'd love to see it! Amalia, It's on tonight and tomorrow on OSN Supermovies. I absolutely adored the film! I cried the whole way through! Lol. i watched the movie...but i bet the book is way better! i will have to pick it up the next time i pass the book store. Angie Nader, inshaAllah, I can't wait to watch the movie later! I love most of the stars, Queen Latifa, Jenifer Hudson,& Alicia Keys. Umm Omar, Do give it another chance, it's really beautiful. Yea alhamdulillah for the book man! Thanks! Shahirah, It's a great story either way. Bzmomma, yea Dakota is really talented. It would be a shame if she ended up like Lindsay or something.